A Day Dreamer's World: Christmas Book Haul! So, Christmas is over-and-done with for another year; and, to my delight when I got to go book-shopping, a year filled with books and me spending most of Christmas day working out where, exactly, they would fit on my bookshelf! I also received a few writing-presents, as well as some merchandise - including the Catching Fire album! 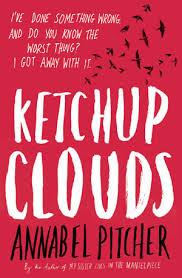 Ketchup Clouds by Annabel Pitcher - If you follow me on Twitter, you may have seen me talking about how 'Ketchup Clouds' was number-one on my wish-list and how much I wanted to read this book! Imagine how excited I was when I walked into Waterstones and it was just sitting on the shelf, ready for me to read! I've heard nothing but great things about this novel, and love the storyline behind it, as it's a really interesting subject, and I'm sure it will be a tear-jerker! Luckily, there is still some Christmas chocolate left-over that I'm keeping; just in case I need comfort-food. Code Name Verity by Elizabeth Wein - Before I bought this, I knew nothing about it except that it was set in the War, something I had figured out without having to be told it. As well as all the hype surrounding this novel, I based picking this up solely on recommendation and am so glad I did! This is definitely going to be one I read as soon as possibly so I can finally discover Wein's writing! I've been warned that I may also need tissues for this one! Shadow and Bone by Leigh Bardugo - I absolutely love great fantasy books, and I think this will really hit-the-spot while trying to find a new series for next year! The sequel has been talked about non-stop, and I read one passage from that to know I must pick up the first book! From just the synopsis, the world building seems both complicated yet, intricate, and I'm already guessing this will be one of my 2014 Books of the Year, despite the fact I haven't even read the first page! 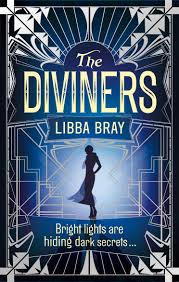 The Diviners by Libba Bray - While I knew I wanted to read the previous three books, this was one I had only read some mixed reviews off, and thought it was just too big for me to enjoy without getting -dare I say - bored. Although, the post I read before I left the house said how good it was, and when I saw it on the shelf, I decided I may as well buy it and see for myself, as the cover is just gorgeous anyway! 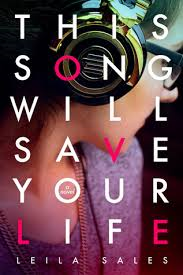 This Song Will Save Your Life by Leila Sheilds - What bad things have I heard about this novel? Absolutely none! I remember wanting an ARC of this when it was first released because the publisher was sending it out with a playlist, and think the whole concept will result in the perfect contemporary novel! I am anticipating this hugely right now! City of Ashes & City of Glass by Cassandra Clare - It's been a while since I first entered the Shadowhunter world when I read 'The Mortal Instruments: City of Bones' and, since the final book is coming-out next year and it will be what everyone is discussing, along with the fact I still don't quite believe the ending of the first book was the complete truth, I bought this so, I would be able to continue the series! I also had a brand-new Catching Fire poster, to stick-up on my wall along with the free-one's I got from a magazine before the film's release, and a calendar; I had one of these last year but actually broke it on Christmas morning - so far I haven't touched the calendar! On a final note, I hope you all had an amazing, book and food-filled Christmas and I wish you a VERY happy even more book-filled New Year! What bookish gifts did you have this Christmas? Any of the above books? OOh nice book haul! I pretty much want to read all those book. Good job, have fun reading! Great books Sophie! I absolutely love Ketchup Clouds and I have no doubt that you'll love it. I think it's the perfect read for you. The Mortal Instruments is like my life and I can't wait to hear what you think of them. I also have The Diviners, a signed copy actually. I met the author and she's hilarious! I must admit though, the size is quite intimidating. Paper Towns is great - isn't any JG book? I'm gonna buy TSWSYL because I read a sample and it sounds great - I love contemporaries! Happy Reading. Code Name Verity is one of my favourite YA novels - it's so beautifully written and you'll DEFINITELY need tissues! I've read it twice now and I just love it so much. Ketchup Clouds, The Diviners and Shadow & Bone are all good too so I hope you enjoy them all! Sophie! So many amazing books. I really loved Ketchup Clouds, and Im dying to read This Song. And I have Paper Towns on my shelf, though it is the old cover. I think I like the new one more. *has clicked play on that Christine Aguilera song* Ack, Code Name Verity looks amazing! I've loved the concept of it since I first came across it! I hope you enjoy it! I got Shadow and Bone too and am actually planning on starting it now! *squeals* SO EXCITED! This Song Will Save Your Live is supposedly amazing! I haven't heard of Ketchup Clouds, but the rest I've all heard a ton of great things about. Enjoy your books! Sophieeeee!!!! I loved Ketchup Clouds and Code Name Verity as you may know, so ENJOY!! Also, Paper Towns is the last JG book I need to read, so I must get hold of that.... I also want to read This Song! !